Oxford Down originated in Oxford, England, as the name suggests. The breeding that was originally done for the needs of the armed forces in the 19th century aimed to enhance the sheep breed’s mutton conformation as well as the properties of its wool and skin. The goal was to use the same animal’s meat for feeding the military, and its wool and lambskin to keep the soldiers warm. Find out more about the Oxford Down here. Nowadays, the focus of breeding is on increasing mutton conformation. Thus far, Denmark has been able to take the breeding furthest, as the Oxford Down has been bred there for about 120 years already. Unfortunately, this development has been declining there too, and now the breeding is dependent on a few purebred breeders only. Animals with excellent breeding values were imported from Denmark to North Karelia at the turn of the 1990s. Since then our purposeful breeding programme has increased the recognition of the breed as well as its successful usage in purebred and crossbred flocks. 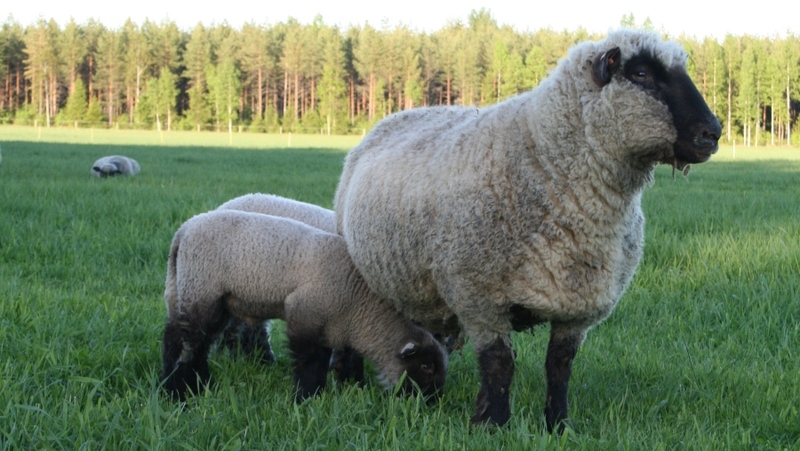 Due to this purposeful breeding program and the selection of animals based on ultrasonic testing of lambs, the breeding value of the Finnish Oxford Down stock has become very competitive. Oxford Down is a large, calm, quiet, stubborn and sensitive breed of sheep. The breed is especially gregarious, which should be remembered when handling the sheep. As a result of breeding, Oxford Down has become a pasture breed, and it is now a careful and thorough grazer. Ewes separated from their lambs are indeed very suitable for taking care of landscaping in traditional biotopes or in woodland pastures. Oxford Down is light brown in color, but the muzzle, ears and hooves are chocolate brown. A full-grown Oxford Down ram weighs 100-160 kg, but regardless of its large size, it is extremely easy to handle and it is easy-going by nature. A mature ewe weighs 80-100 kg. The breed is hornless and long-tailed, and it has very dense, straight and medium-type wool. As the Oxford Down’s wool does not thicken easily, the sheep do not necessarily need to be sheared more than once a year. We shear our stock every eight months on average. The Oxford Down ewes have good maternal qualities and milk production ability. The average number of lambs is 1.9 lambs per ewe, starting from the second lambing. Single lambs’ birth weight is approximately 6.5-9.0 kg and twins’ 4.0-7.5 kg per lamb. The 6-week-old lambs quite often weigh more than 20 kg, which shows that the ewes certainly have good milk production ability. The breed is muscular and known for gaining daily weight rapidly. The average daily weight gain for lambs is 300-400 g until the age of 4-5 months. At four months, the lambs usually weigh more than 40 kg. As is typical for a meat-type breed, Oxford Down lambs are muscular and lean, and the marbling of the fat inside the muscle explains the succulence and deliciousness of the meat. The Oxford Down is a so-called “cold breed” which means that the lambs are born with a coat of wool and are most comfortable in a cool barn. Mature animals can spend the winter in an uninsulated cowshed, as long as the bedding is kept well and water is kept unfrozen. During lambing, the temperature should be around 0 °C in the sheep shed, but when the lambs are a week-old, they and their ewes manage well in an uninsulated room. As the Oxford Down thrives in rather plain conditions and is an excellent pasture breed, it is possible to practice economical sheep farming here, in the pure natural setting of North Karelia.